The photo below, taken at the US Holocaust Memorial Museum in Washington, DC, is shown in the newspaper article. How do we know that these shoes “covered the feet of Jewish men, women and children before they were sent to the Nazi gas chambers,” as stated in the article? The Nazis did not keep records of the names of the Jews, who were sent to the gas chamber, but they wanted the world to know that they were gassing the Jews, so they devised a plan to save the shoes as evidence. 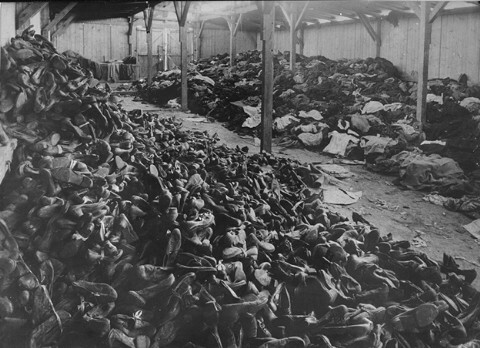 Even at Bergen-Belsen, an exchange camp, which did not have gas chambers, the shoes were saved in huge piles, as shown in the photo below. 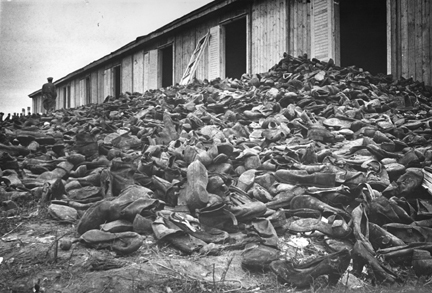 The largest piles of shoes, an estimated 800,000 pairs, were found at the Majdanek death camp, where it was originally claimed by the Soviet union that 1.5 million Jews had died. 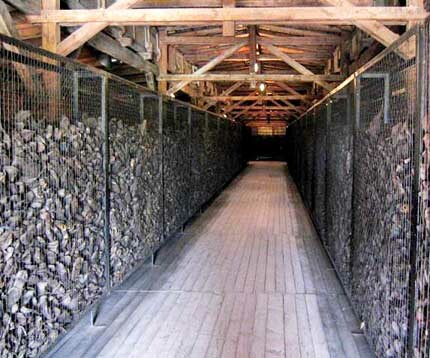 Now, it is claimed that only 59,000 Jews died at Majdanek. 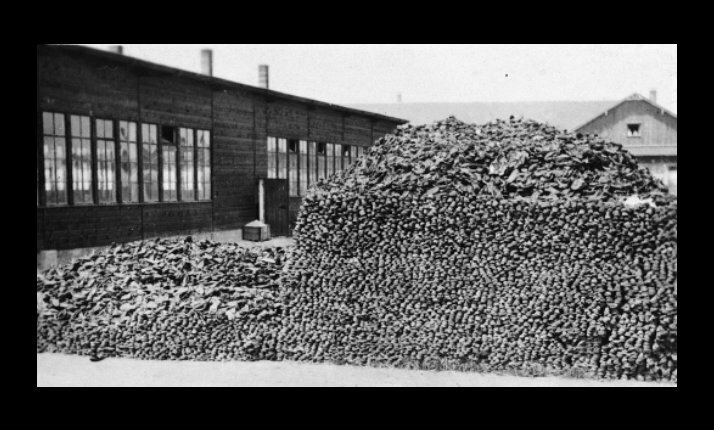 Why were so many shoes found at Majdanek? 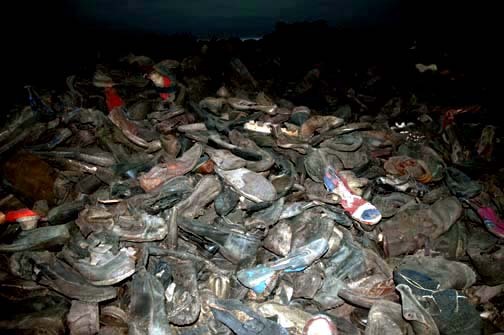 It could be that each of the 59,000 Jews, who died there, brought several pairs of shoes with them. You never know when you might need a change of shoes. The photo below was taken by Simon Robertson at the Majdanek Memorial Site. 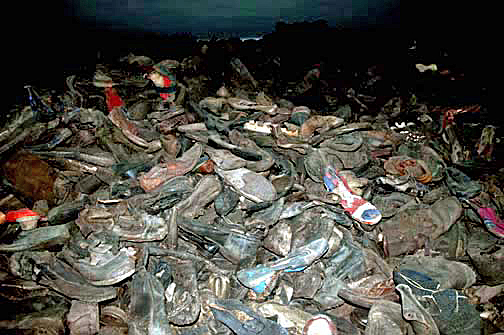 A huge pile of shoes, which included baby shoes, was found by the American liberators of Dachau in April 1945. These shoes are shown in the photo below. At Auschwitz-Birkenau, where 900,000 Jews were killed, according to the latest figures, there were more shoes found. What were the Nazis planning to do with all these shoes? Were they saving them for future museums to display as evidence of the gassing of the Jews? During World War II, the Germany people had plenty of shoes; they were not suffering at all during the bombing of German cities — NOT! The German soldiers had plenty of good shoes; the Nazis didn’t need to recycle shoes for their soldiers — NOT! Use your heads, people. Don’t write silly news stories like the one cited above. So what does buying a German car have to do with the worn-out shoes found at Auschwitz and other concentration camps by the Allied liberators of the camps? I previously blogged about the worn-out shoes here. In the absence of any records which include the names of the 6 million Jews who were killed in the genocide of the Jews, known as The Holocaust, the shoes are used to represent the six million. 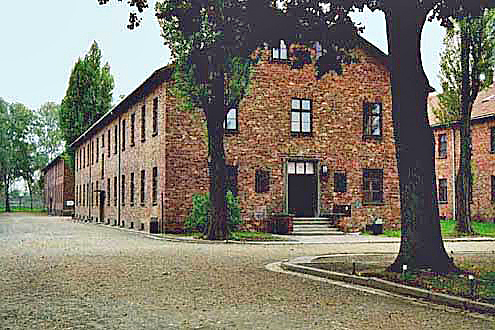 A typical tour of the main Auschwitz camp begins in Block 15, shown in the photo above, which houses an exhibit entitled Historical Introduction. Organized groups begin their tour of the museum buildings here and then move on to Blocks 4, 5, 6, and 7 which are in the last row of barracks buildings. Block 5 is similar to Block 15, shown in the photo above. In Block 5, there are displays devoted to the “Material Evidence of Crime.” One of the displays shows hundreds of shoes in a huge glass case that takes up half of a barracks room. The shoes seem to be deteriorating and are mostly the same dark gray color, except for a few women’s or children’s shoes that are made of red leather. The red shoes stand out like the red coat worn by the little girl in Schindler’s List, a black and white picture. 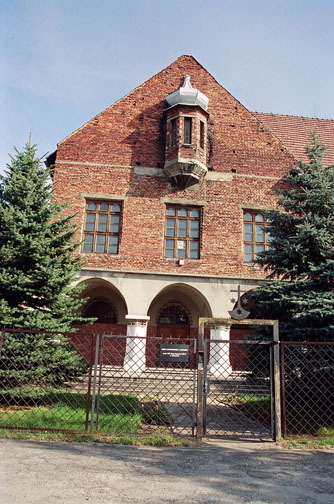 The Theatergebäude (theater building) which is located just outside the Auschwitz main camp, was used as a clothing warehouse and it was stuffed full of clothing and shoes when the camp was liberated by Soviet troops on January 27, 1945. Why didn’t the Nazis burn the shoes in the Theater building to destroy the evidence of the killing of the Jews? It must have just slipped their minds, or maybe it was because they didn’t want to destroy such a nice brick building. 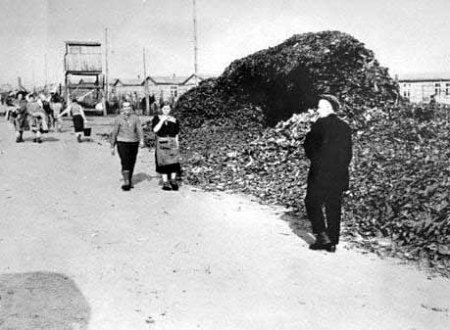 All but six of the clothing warehouse buildings at Birkenau had been set on fire when the camp was abandoned by the Nazis on January 18, 1945 and, strangely, the buildings were still burning when the Soviet liberators arrived on January 27, 1945. 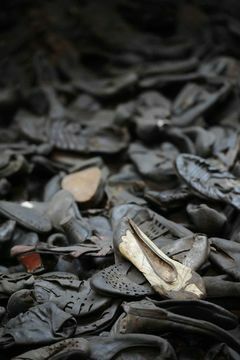 In any case, the Nazis left behind 43,000 pairs of shoes which were found in one of the six warehouses at Auschwitz-Birkenau, which were not set on fire. These shoes have been divided up among several Holocaust Museums, including the US Holocaust Memorial Museum in Washington, DC. 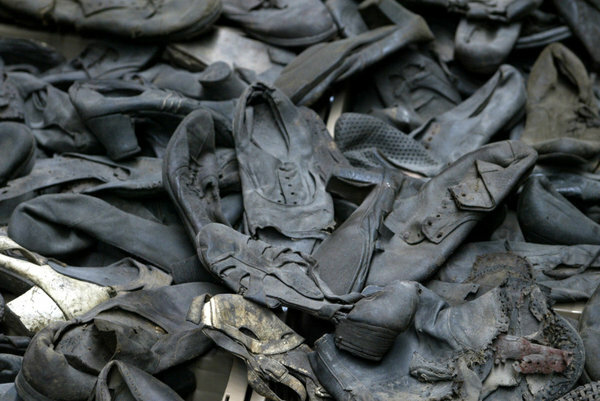 The shoes, from the warehouse at Auschwitz-Birkenau, are symbolic of Jewish hatred of Germans, which extends to the next generation and beyond.